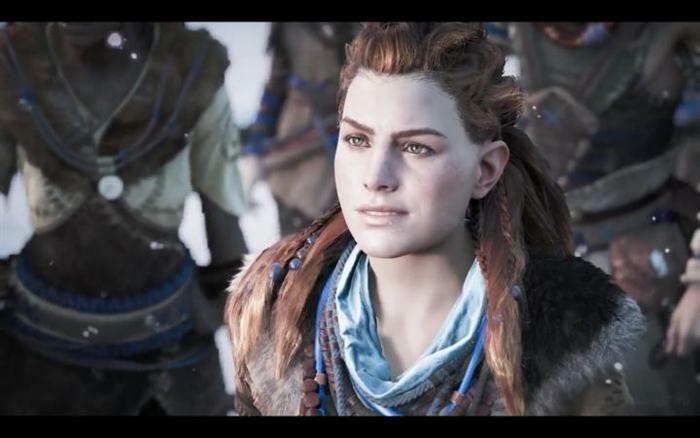 Aloy has a number of different Outfits in Horizon Zero Dawn. They not only provide a nice cosmetic change to her character's appearance but also substantial gains in combat with many armour pieces providing protection against different types of machine attacks such as Fire, Freeze, Corruption, Shock etc. In this guide I'll show you each of the best Outfits along with stats and any walkthrough steps to obtaining them. As I mentioned in some of my other posts, some of the Very Rare Outfits are obtainable through the regular quest whilst others are hidden deep underground in Cauldrons and a few are part of "treasure hunt" side quests. Outfits (commonly referred to as armour) come in three types of rarity. The colour of each inventory item determines its rarity and thus as a result its value, power and effectiveness. The rarity type (colour) for each Outfit is clearly visible in the inventory screen shown above. Purple items are the equivalent to Heavy, Blue is Medium and Green is Light armour. 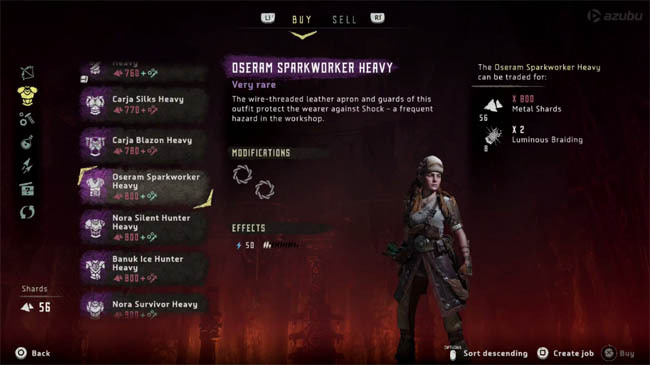 The screenshot above shows the "Oseram Sparkworker Heavy" which is a very rare heavy Outfit. It has two Modification slots and provides protection against Shock damage (50). All of the very rare Outfits can be traded for a large sum of Metal Shards if you prefer. 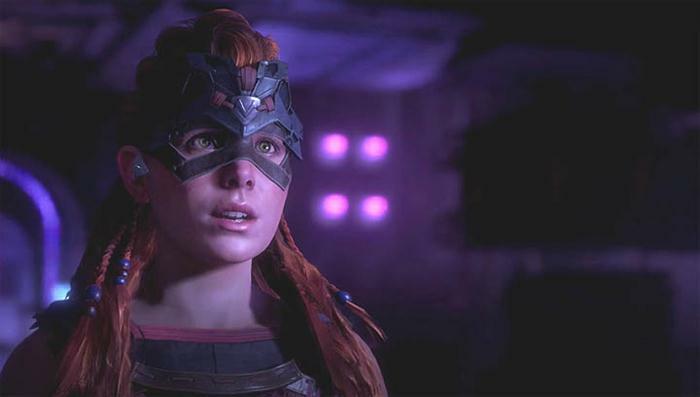 True RPG fans will prefer to collect the best looking outfits and for good reason - not only do they appear during the regular 3rd person view but just like in the Witcher 3, Aloy's Outfit appears during all of the cutscenes. 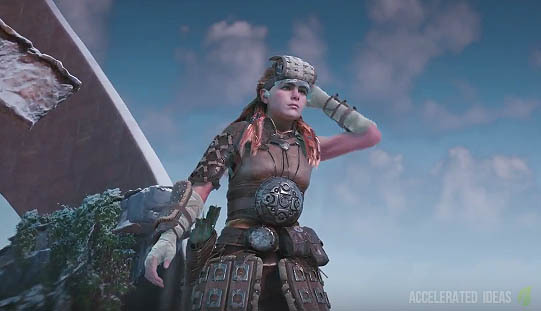 Many of the higher tiered Outfits have modification slots that players can select to further improve and customize their armour. Modifications aren't free and you'll need to collect these separately during the game. 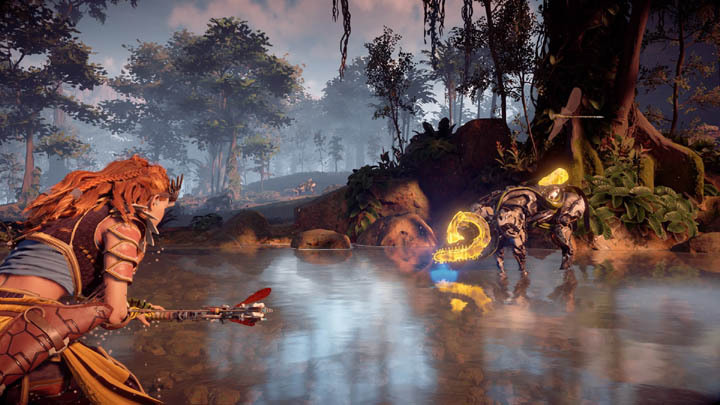 A good example is killing one of the many robot beasts in the game. For example, when I killed a Stormbird I collected the "Resist Corruption Weave" which offered 26% resistance to corruption and could be equipped to any of my Outfits with a free Modification slot.